7th lunar month of 1695: his father Nanboku Sabu I died. 1708: he took the name of Nanboku Sabu II in Ôsaka. 11th lunar month of 1709: Sabu performed as a dôkegata in the kaomise drama "Onna Gosho Bunko", which was produced in Ôsaka by Shinozuka Shômatsu I. 11th lunar month of 1711: Sabu played in Ôsaka the role of Daidôji's kerai Yogonoshin in the kaomise drama "Futabashira Aioi Chôja", which was coproduced by Ogino Yaegiri I and Miyazaki Denkichi. Fall 1712: Sabu went to Kyôto. 11th lunar month of 1712: Sabu performed in Kyôto in the kaomise drama "Banbanzai", which was staged at Miyako Mandayû's theater. 11th lunar month of 1713: Sabu performed in Kyôto in the kaomise drama "Jûraku no Miyako Yaoyorozuyo", which was staged at Miyako Mandayû's theater. 11th lunar month of 1714: Sabu played in Kyôto the role of Yogohei in Sadoshima Saburôzaemon's kaomise drama "Yorozuyo Saiwai Gura", which was staged at Miyako Mandayû's theater. 11th lunar month of 1716: Sabu played in Kyôto at Hoteiya Umenojô's theater the role of Oimatsu Tsurutarô in the kaomise drama "Daikoku Tenjin Fukuju Musume", which was produced by Yamatoya Jinbê III. 11th lunar month of 1717: Sabu played in Kyôto the role of the motoyuiya Tamasuke in the kaomise drama "Genjôraku Biwa no Ôumi", which was produced by Yamatoyama Jinzaemon I. 11th lunar month of 1718: Sabu played in Kyôto the role of Megawa Denpachi in Adachi Saburôzaemon's kaomise drama "Shiga no Miyako Kogane no Hanazono", which was produced by Yamatoyama Jinzaemon I for the nadai Ebisuya Kichirôbê. 11th lunar month of 1720: Sabu performed in Kyôto in the kaomise drama "Shin Yakata Fukutoku no Kado", which was produced by Matsumoto Shigemaki and Sodesaki Wakaura I. 1st lunar month of 1721: Sabu played in the same theater the role of Matsuya Rihê in the new year ni-no-kawari drama "Keisei Kuruma Yadori". Fall 1721: Sabu went to Ôsaka. 11th lunar month of 1721: Sabu performed in Ôsaka at the Kado no Shibai in the kaomise drama "Kogane no Shachihoko". 1st lunar month of 1722: Sabu's rank in the Ôsaka hyôbanki, dôkegata section, was jô-jô-(shiro)hankichi (superior - superior - (white) half excellent) [visual]. 11th lunar month of 1722: Sabu played at the Naka no Shibai the role of the gofukuya Kanshichi in the kaomise drama "Odori Hotei", which was produced by Takeshima Kôzaemon II. 1st lunar month of 1723: Sabu's rank in the Ôsaka hyôbanki, dôkegata section, was jô-jô-(shiro)kichi (superior - superior - (white) excellent) [visual]. 1st lunar month of 1724: no record in Kyôto or Ôsaka hyôbanki . 11th lunar month of 1724: Sabu played in Kyôto the role of Gonbê in the kaomise drama "Yomeiri Miyako no Shimadai", which was produced by the zamoto Ogino Umenosuke for the nadai Ebisuya Kichirôbê. 1st lunar month of 1725: Sabu's rank in the Kyôto hyôbanki, dôkegata section, was jô-jô-(shiro)hankichi (superior - superior - (white) half excellent) [visual]. 11th lunar month of 1725: Sabu played in Kyôto at Hayagumo Chôdayû's theater the role of Sekiguchi Hikokurô in the kaomise drama "Ôkamado Hatsumen Bako", which was produced by Sanogawa Mangiku. 1st lunar month of 1726: Sabu's rank in the Kyôto hyôbanki, dôkegata section, was jô-jô-(shiro)kichi (superior - superior - (white) excellent) [visual]. 1729 ~ 1730: Sabu performed for two seasons in tabi shibai. He was for example recorded as performing at the Kitano Hirano no Shibai. 11th lunar month of 1731: Sabu played the roles of Minamoto Yorikane and the servant Tokusuke in the kaomise drama "Hiragana Imagawajô", which was produced in Kyôto at Miyako Mandayû's theater; his stage partners were Nakamura Tomijûrô I, Nakamura Shingorô I, Sanogawa Mangiku, Somenoi Hanshirô, Yashio Ikuemon, Anegawa Chiyosaburô I, Arashi San'emon III and Tomizawa Montarô I. 1st lunar month of 1732: Sabu's rank in the Kyôto hyôbanki, dôkegata section, was jô-jô-(shiro)kichi (superior - superior - (white) excellent) [visual]. No record afterwards. Nanboku Sabu II was a dôkegata actor, who was active in Kamigata from the end of the 1700s to the beginning of the 1730s. 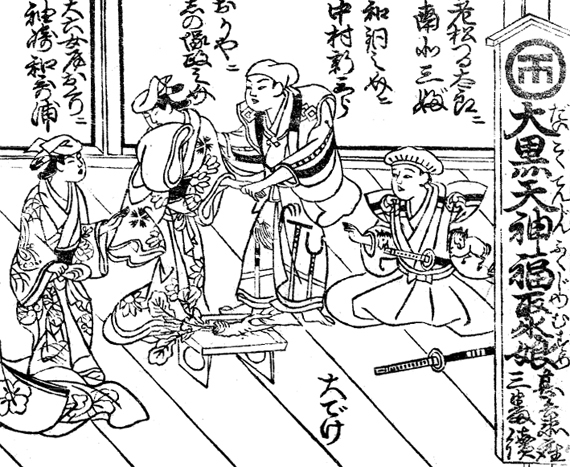 In Nojima Jusaburô's book "Kabuki Jinmei Jiten", the reading of the first name was Sanbu, not Sabu. Was he on sick leave, in tabi shibai or in miyaji shibai?